I’ve been away for several days (one longer than intended, due to travel issues!) and have therefore not been cooking. However, during C’s hen party, we did spend an afternoon at The Cellar Door making chocolate. We turned up and were immediately ushered downstairs. We were invited to choose a 2 course lunch from the menu, after which we would make our chocolates. They would be chilled, and lunch would be served after that. All sounded good so far. First, the chocolate making. We were each presented with separate blocks of milk and dark chocolate ganache, and the table was covered in plates and bowls with melted milk, white and dark chocolate, cocoa, nuts, sprinkles, marshmallows, fudge and other treats. We had to mould the ganache with our hands and fill and cover it as we wished. 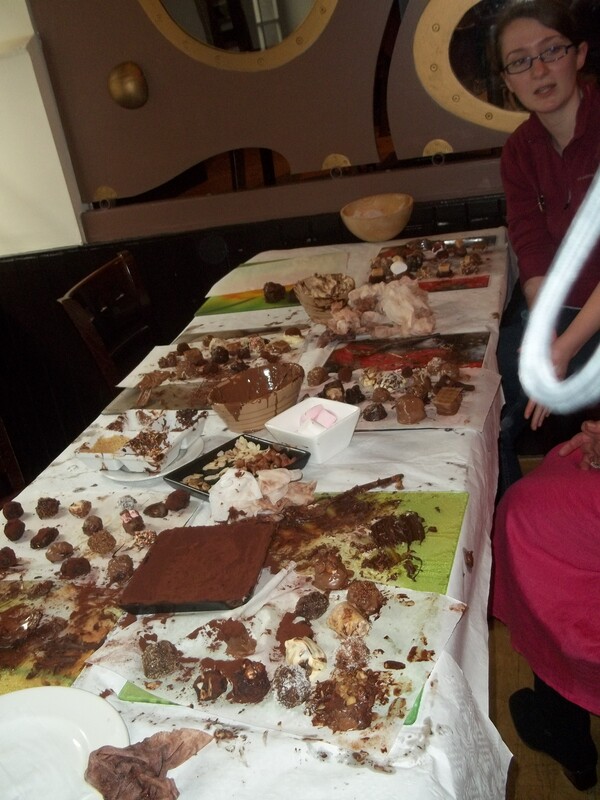 It was great fun (though incredibly messy!) and a prize went to C’s bridesmaid I for making the best choccies (apparently they were some of the best they had ever seen on the course – what a teacher’s pet!). Unfortunately mine suffered significant melting on the journey home, but they nevertheless tasted yummy. For lunch I ordered breaded haggis with chutney and salad to start, followed by grilled hake with lemon and herb crushed potatoes. It had been a toss-up between the fish and a skirt steak sandwich, but I tried a little of the latter from R’s plate. I was seriously seriously impressed. The plates were presented beautifully, but there had been no scrimping on the quantity of food. My haggis was light rather than greasy (which I had feared slightly) and went fantastically with the chutney. I had never eaten it like that before, and it was delicious. I would have been really happy with the steak sandwich, as the beef was cooked to rare perfection, was seasoned wonderfully and was served with a delicious-looking homemade coleslaw. 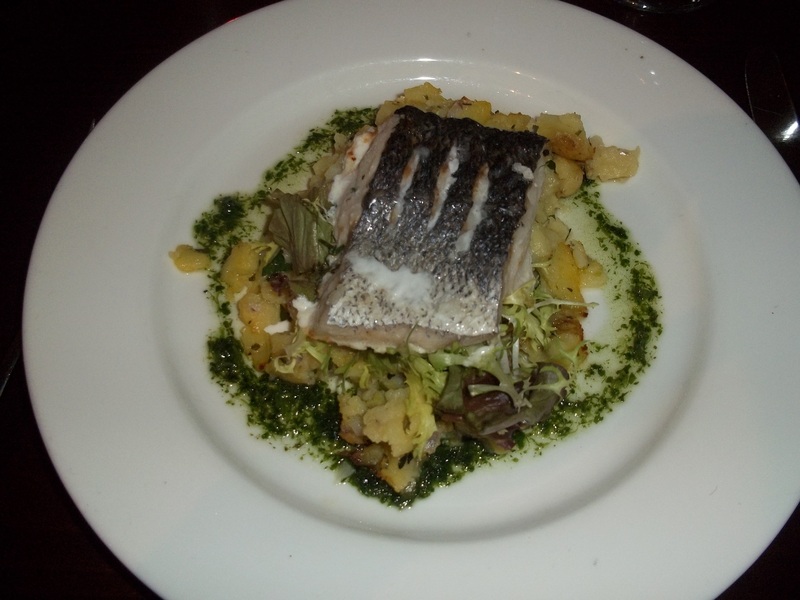 My hake was moist and tender, the potatoes slightly buttery and perfectly herby. I just had to take a photo of my lunch because it looked so lovely. I would 100% recommend The Cellar Door. The staff were friendly and attentive, but not pushy. The chocolate-making was good fun and perfect for the occasion, but if you don’t fancy it they do cook meals anyway 😉 The thing I found most amazing was the quality of the lunch. Ordinarily, a 2-course weekday lunch like we had costs only £7.95 per person. I had to check that price about 15 times because it was some of the best restaurant food I’ve had in a long time, and certainly the best I’ve ever eaten at that price! I will definitely be revisiting The Cellar Door if I am in Edinburgh again. My only slight criticism was that the area our table was in could have done with a little more lighting – perhaps a nice standard lamp in the corner. But all in all it is only a minor thing which by no means affected how impressed I was with the place.